Last week, World Jewish Congress President Ronald Lauder released a series of statements confirming that he had encouraged U.S. President Donald Trump to recognize that peace between Israelis and Palestinians was now attainable. He also stressed that he considers PA President Mahmoud Abbas to be a moderate committed to peace. Implicit in his narrative is that the Israeli government and especially Prime Minister Benjamin Netanyahu had previously been insufficiently flexible but that Trump could succeed in his efforts. We have just celebrated Independence Day and are approaching commemoration of the 50th anniversary of the Six-Day War and reunification of Jerusalem. The country is in great shape; the economy is booming and we have emerged as a formidable military power. With a U.S. administration that pulls no punches about its support and alliance with us, Israel is well-placed to achieve many of its long-term strategic goals, including resolution of borders, agreed parameters of settlement activity and ultimately, formal annexation of the major settlement blocs and Golan Heights. But these require skillful diplomacy and sensitivity to Trump’s belief that he can negotiate a peace settlement with Abbas even though his predecessors have failed. What has recently transpired among American Jews is somewhat surreal. Leaders of the progressive religious denominations are behaving as though possessed by a dybbuk. But the situation has now become far more disconcerting. Lauder, who over the years has conducted private meetings with Abbas, is seeking to persuade Trump, with whom he has enjoyed a close relationship for many years, that Abbas is sincere and genuinely willing to make peace. I have personally known Lauder for over 20 years and can testify that since his tenure as U.S. ambassador to Austria, he has devoted himself to the Jewish people and the welfare of Israel, to which he has made major contributions, both philanthropically and by direct investment. Lauder’s generous philanthropic contributions were largely responsible for the revival of the decimated remnants of Jewish life in Central and Eastern Europe. Last month, he was elected for a third term as president of the WJC, the international Jewish umbrella body. He successfully reinvigorated the organization after its total collapse in the wake of the corruption scandal that engulfed it following discovery by the New York attorney general of severe financial malpractices. Over the last decade, Lauder succeeded in recruiting top professionals, restructuring the organization, and restoring its status as the premier body representing Diaspora Jewry. Lauder had a close, almost intimate relationship with Netanyahu and loyally supported him during his years of isolation after his 1999 defeat by Ehud Barak. But the relationship ended some five years ago when, as a major shareholder, Lauder was unable to prevent Channel 10 from broadcasting a vicious campaign demonizing Netanyahu’s family. Since that time, Netanyahu has distanced himself from Lauder and the WJC. In a lengthy conversation with Lauder, I failed to dissuade him and convince him of the realities of the situation. He spoke with an almost messianic fervor about the peace which we could now grasp. Setting aside the issues, I reminded him that he was breaching an iron law governing Diaspora Jewish leaders: Those not resident in Israel cross lines when they canvass foreign governments to intervene in the security policies of the elected Israeli government. I also emphasized that on these issues, Netanyahu was implementing policies supported by the clear majority of Israelis. What makes his behavior even more outrageous is that Lauder confirmed that he had never discussed his plans with the prime minister. So, on whose behalf was he acting? He did claim that three formal efforts to engage in dialogue were initiated but Netanyahu had adamantly refused to meet him. When I spoke to the prime minister, it was clear that Lauder’s intervention with Trump angered and distressed him. He referred to Lauder as “my biggest challenge to overcome” because he has immense influence on Trump and is promoting a peace program that had been rejected by Israel but was attractive to an American president possibly easily seduced into believing that a quick peace could be achieved. 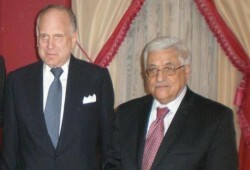 I warned Lauder repeatedly that he was being conned by the duplicitous Abbas who is an inveterate anti-Semite but speaks with a forked tongue, portraying himself as a man of peace and moderation to the outside world while continuing to encourage religious hatred and anti-Semitism among his own people. Coexisting with Israel as a Jewish state. Agreeing to Israel implementing whatever security is required to ensure that a Palestinian entity is demilitarized and prevent the Iranians from approaching. Accepting that the major settlement blocs will be incorporated into Israel. Bringing an end to the foul exhortations of hatred emanating from the mosques, schools and media depicting Jews as subhuman, calling for the destruction of Israel and inciting to murdering Israelis. Relinquishing the Palestinian “right of return” to Israel. Terminating weekly payments to murderers of Jews and pensions to their survivors. Ending the sanctification of mass-murderers by naming schools, city squares and even football clubs to commemorate them. I predict that Abbas would not concede to any of the above. All he seeks is to persuade Trump to carry on the negotiations — while ceding nothing but making false gestures and undermining Israel internationally. Abbas, who has avoided democratic elections, is now despised by his people for his corruption, and has imbued them with such hatred of Israel that, even if he wanted to make concessions, he wouldn’t be able to do so without being toppled or assassinated. I also asked Lauder, if Israel and the PA were to reach an agreement involving more territorial concessions, what would prevent Hamas from moving in on areas no longer protected by Israel? However, I failed to move Lauder. He told me he is being flooded with letters of support including many from former critics. I responded that this should not be perceived as positive, and that most responsible Jewish leaders were reluctant to offend him by telling him what they thought. Although, like most Israelis, I pray for a genuine peace, I am fearful that despite his good intentions, Lauder may be inadvertently undermining one of the best opportunities we have ever had with the U.S. as a genuine ally. Because of his proximity to Trump, the result of his intervention may be even more damaging than J Street’s campaign to undermine Israel. He insists that if his efforts fail, we will have tried, nothing will have been lost and we will simply return to the status quo. There is no certainty that Trump will continue to be influenced by Lauder. Should he do so, it may be well-nigh impossible to retract and relations could be permanently affected by any fallout. Lauder is a loyal and devoted friend of Israel. He has no second agenda. He is dedicated to the interests of the Jewish people and his good intentions are not in question. But he should take a step back and recognize the possible dire consequences if, as most of us fear, his well-meaning but seriously misplaced personal intervention could backfire. He should immediately come to Israel and meet with the prime minister, who must set aside their past differences, engage him in dialogue and seek to persuade him to back down before Trump makes his final moves and visits the region.